“Big Data” offers today’s scholars vast opportunities for discovery and insight, but having the right data is often better than having more data. “Little data” can be just as valuable as big data. 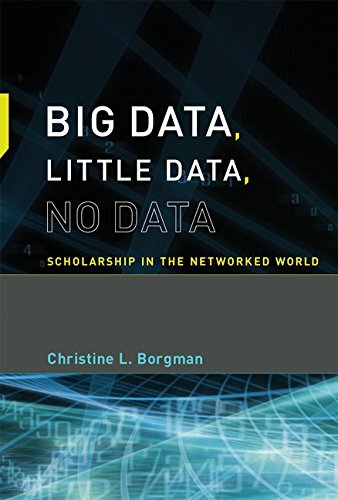 In many cases, scholars have no data because relevant data do not exist, or cannot be found, or are not available. Moreover, sharing data is difficult, incentives to do so are minimal, and data practices vary widely across disciplines. The argument of this book is that data have no value or meaning in isolation; they exist within a knowledge infrastructure – an ecology of people, practices, technologies, institutions, material objects, and relationships. After laying out the premises of this wide-ranging investigation – six “provocations” meant to inspire discussion about the uses of data in scholarship; competing definitions of “data;” and social, policy, and economic aspects of research data – the book presents case studies of data scholarship in the sciences, the social sciences, and the humanities. The book also assesses the implications of these findings for scholarly practice and research policy. Concluding chapters explore releasing, sharing, and reusing data; credit, attribution, and discovery; and what to keep and why. In sum, the book argues that to manage and exploit data over the long term requires massive investment in knowledge infrastructures. At stake is the future of scholarship. The eScholarship site contains entries for most of Professor Borgman’s 150+ publications. Also included are abstracts, slides, and video links for recent presentations, and recent course syllabi. Entries are grouped by format (e.g., books; journals; book chapters; conference papers; reports, articles, posters, panels, and interviews). Each section is organized in reverse chronological order. The site is also keyword searchable and is updated regularly.